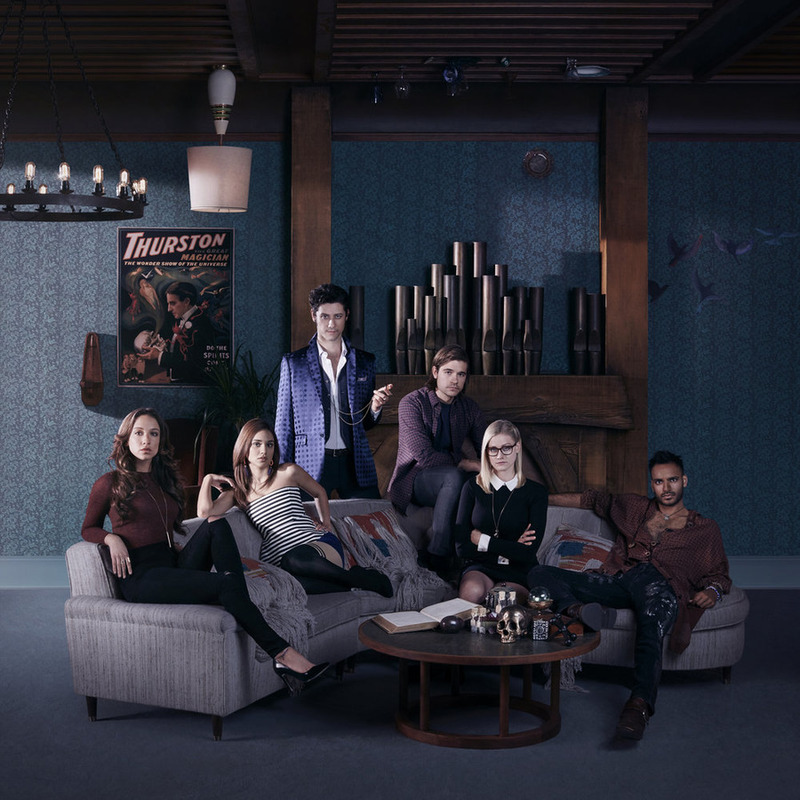 OHSOGRAY attended the recent Television Critics Association presentations, where the cast and producers of Syfy’s new show, The Magicians, participated in a Q&A. Based on the best-selling novels by Lev Grossman, there were lots of delicious hints dropped at what fans can look forward to in the first season. 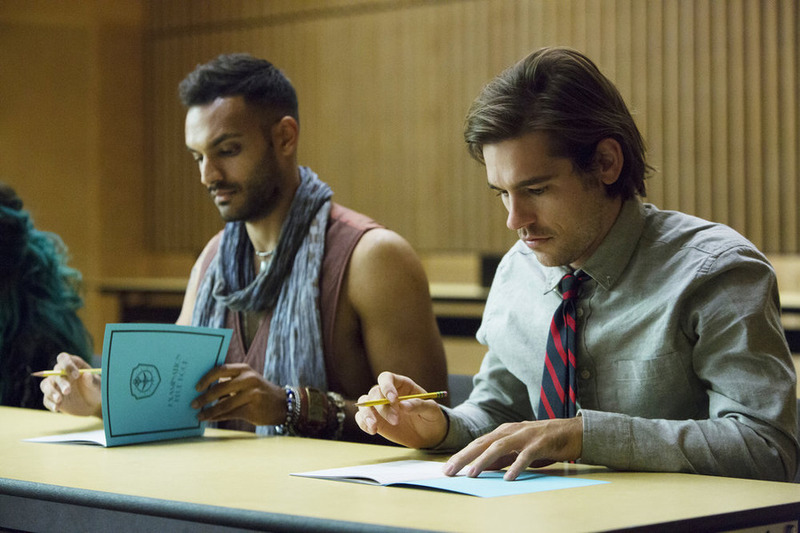 The Magicians premieres January 25 at 9/8c on Syfy, but you can catch the first episode online now. How close do you stay to the books and where do you diverge? John McNamara: There’s a lot of spoilers in that. Sera Gamble: There are. I think our main goal with the show is to stay true to the spirit of the book. There’s so much about the spirit and world building that Lev Grossman did that really compelled us. So I think the process in the writers’ room is sort of the Talmudic interpretation of Lev’s text. Sometimes we veer left. Sometimes we find another way into the door. But I think most of the big plot points that people love from the books, we’re getting to them. Michael London: We also worked very close with Lev, and Lev was part of the process all along the way. If we made any left turns or right turns, it was always with his blessing and cooperation. The books are a trilogy, so will you go beyond them to keep the story going if the show is successful? John McNamara: Yes. But we also think there’s enough material for six seasons. I don’t want to stay after six seasons. You guys don’t want to see me up here six years from now. Ms. Gamble’s show [Supernatural] is going on to its 12th season, I think? John McNamara: Yeah. But she threw a punch and pulled the ripcord. Michael London: The book has a lot of characters, a lot of storylines. The collection of books can actually go off in almost infinite directions. So we’re actually excited about doing more than exists in the three books. Had any of the actors read the books before becoming involved with the show? Hale Appleman: My best friend handed me the first book when he found out I was auditioning, and he said, “This is my favorite book series. You have to read it.” And I finished the trilogy before knowing whether or not I had gotten the part. Have any of you worked with magic or wished you had a magical power? Stella Maeve: My first job was actually above a Sbarro’s as a magician’s assistant when I was, like, 17 in New York. It was really funny, yeah. I think everybody wishes that they could acquire something magical in their life, whether it’s real or not. That’s what’s so cool about the show, it’s very much art imitating life or life imitating art. I wish I could become invisible sometimes and maybe time travel now. That would be pretty cool. Were you awed by seeing what an illusionist can do when you were an assistant? 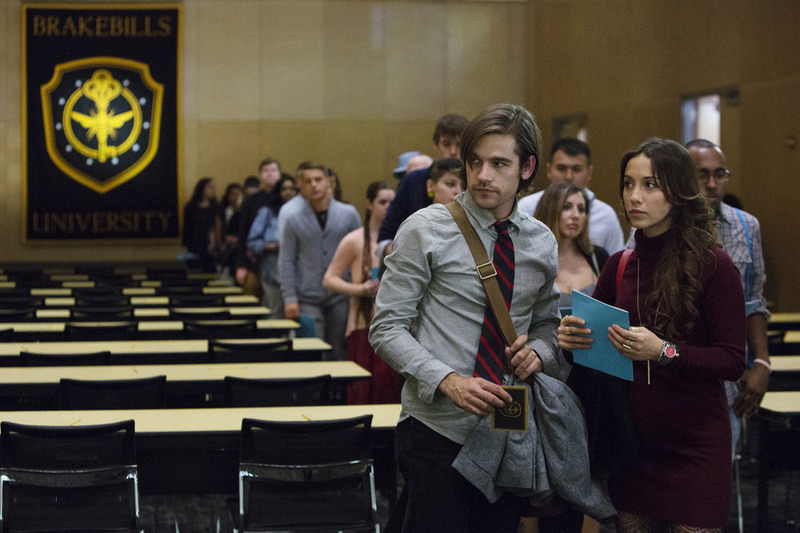 Stella Maeve: It probably loses a little bit of its magic. But what’s so cool about this show is that we incorporate all sorts of cool things. We’ve created this thing called finger tutting, which is almost like a dance with your fingers. It’s basically choreography and that mixed with the special effects turns out really, really cool. We all had a lot of fun with that. Arjun Gupta: Our producing director Scott Smith has a friend, Bro Gilbert, I think, is his name, and he is a magician in Vancouver. When we were prepping that first week, he came over and taught the six of us some tricks, some sleight of hand, to give us the feeling of what it would feel like, kind of that awe that would come about once you can perform magic, and that was really fun. We had fun with it for a while. Stella Maeve: Jason’s good with cards. 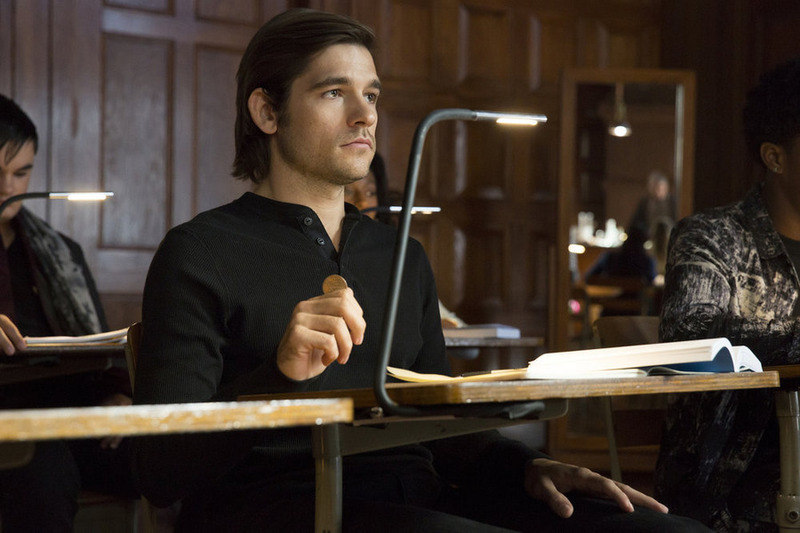 Jason Ralph: Yeah, I got to learn a few illusions and a lot of sleight of hand card tricks for the role. I guess the coolest part about that is learning how to learn magic tricks. Magic is really difficult to learn, and it requires sort of a fanatical eye for detail. Learning how to learn magic in the real world, in this world, is very similar to how to learn magic in the show’s world. It’s very difficult. It’s more complicated than waving a wand and saying a word. It’s a little bit more like organic chemistry and like really easy to kill yourself with. In addition to the fantastical stuff and the mythology, Quentin clearly suffers from depression. How much of that real life stuff will also come into play in the story? Sera Gamble: As much of it as possible, always. I think of all of the fantasy stuff as an excuse to tell stories about people and to tell real, hopefully emotionally sophisticated, complicated stories about 20 somethings in this case. Quentin is a gold mine of neuroses and fears and aspirations, and magic is just the lens through which we see this person grow up and become the man that he’s going to be. There are a lot of interesting stunts in the show, including flying, can you describe how that all comes together? Arjun Gupta: We have a really incredible team that has been around us with the stunts we had in Vancouver, with Stunts Canada and our special effects guys, that really put us in really safe experiences. We do a lot of practical magic on the show, and that was something that, I think, was really important to us, to not just have it be all visual effects but keep true to the reality of this experience. We get to do a lot of fun stuff. You guys will get to see a lot of fun stuff. Stella Maeve: Physically, it was super fun having to be hooked into the harnesses and stuff. To play on what Arjun said, we had a great team. They helped us. I had a really good time doing it. I’m a little bit of an adrenaline junkie. But I think everybody here got to use their physical bodies in some sort of aspect and were able to enjoy it and have a good time. Arjun Gupta: We set things on fire all the time. Sera Gamble: Sometimes even for work. For Michael, you’ve been trying to develop this property for a few years now and there was a Fox pilot that didn’t go to series. How did this finally get moving forward again? Michael London: Great question. John and I were working on film project, on “Trumbo” actually. Lev Grossman and I were sort of licking our wounds from the experience of not getting the show made the first time. John said I have a friend who worships these books more than life itself, and that was Sera Gamble, who I didn’t know. Sera came in with this fully imagined vision for the world that was very much in sync with what Lev wanted, which was not a show driven by spectacle, even though we have a lot of great spectacle, but driven by the idea that magic is this metaphor for young people trying to figure out their lives and magic is not the cure all that they’d like it to be. Because like anything you do in life, you want it to fix you. That was the thing, I think, that Sera sort of identified, that John identified, and it really came from the power of what they wrote. We actually wrote it on spec. They wrote it on spec, so we didn’t develop it in the system. We sold it to Syfy, and we got to make the show that wanted to make because we had sort of taken control at that point. Stella, can you talk about your character’s arc? Did the actors have a chance to meet and work with Lev? Olivia Taylor Dudley: It was amazing. He’s been so supportive the whole time. He came up and visited us in Vancouver and was on set for a few days, and he was just so excited to see his characters come to life and to see all the different things that we’d done with them and getting to branch out from the books and bring them back to the books. He’s been really supportive the entire time, and it’s nice to know that we have somebody in our corner who we can just email him or call him and be like, “What would Alice do in this situation if you were writing her in this?” He volunteers that information. It’s been a wonderful collaboration. A central theme of the stories is the transition to adulthood and disillusionment. Can you talk about that in how you connected with the story? Arjun Gupta: I don’t know why I’m going to bring up Hinduism, but I am. There’s a philosophy in Hinduism called “maya,” which is the grand illusion. I think that is the grand illusion of life, is that it can be solved, that it can be fixed, or that there is perfect. It’s born out of a fear. It’s born out of a desire to control. I think that what I responded to so deeply for these books was that theme was explored so truthfully throughout the books. It is something that we are honoring very truthfully in the show. Hale Appleman: I think there’s also a great desire for a lot of these characters to escape into fantasy and to sort of disappear from the hardships of their real lives. They’re always confronted with challenges that bring them back to reality and cause them to confront what they really have to in order to grow and evolve as people. So that’s sort of the hinge pin of fantasy and reality, I think, in large part for the characters. 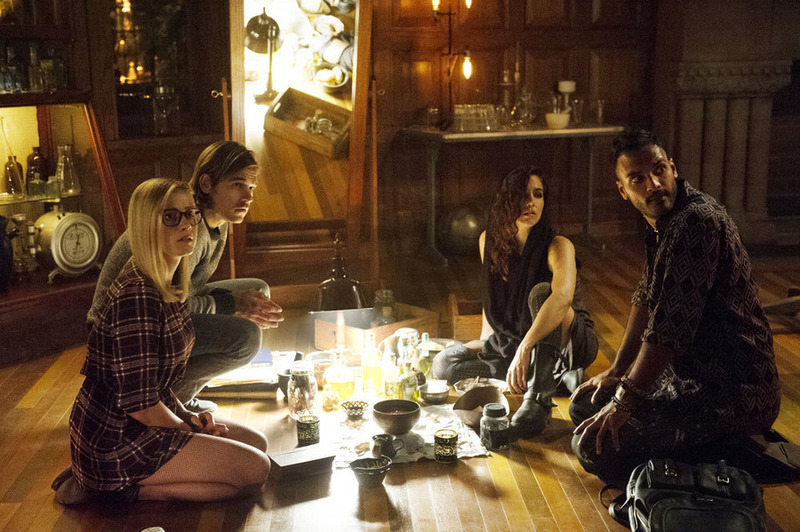 Olivia Taylor Dudley: I think it’s beautiful that magic is what the show is about, and the whole time, you think magic is going to fix everything. Every character is confronted with magic isn’t going to fix anything. Just like in life, there’s no quick fix. Every time our characters get stuck in a dark path, magic is there to support them, but in the end, it’s who they are as people and who they have become and who they will become that will make them great really. Do you believe in magic or the supernatural? Summer Bishil: I’ve always likened the feeling of when you’ve really attached yourself to the character you’re playing as magic. It feels like a force is with you when you’re really connecting to somebody else in a scene and discovering a way of looking at things that you wouldn’t have otherwise seen. So just discovering these characters felt like magic at a lot of times. As we said earlier, there was so much practical magic. So if something was supposed to explode, it did, and it surprised you. Magic was always this force that was slowly emerging around us every day on set. Arjun Gupta: Hale, you have a funny story about the rams. Hale Appleman: Oh, yeah. I would say that it’s pretty understood that, I guess for me and I share your belief that the universe sort of taps you on the shoulder and shows you something when you need to see it, or if your eyes are open, it’s right there in front of you. When I was auditioning for the show, I kept seeing images from the book in my real life. I would see a building that reminded me of Castle Whitespire, or I would be hiking and see a weird bird or creature that, like, I had never experienced before that reminded me of Fillory. I was sitting in the backyard reading one of the novels, and I think I was probably between callbacks for the show. This little lawn ornament that my landlord had had been sitting out for however many years I had lived there. I was reading through, and we were in Fillory, and the characters are talking to Ember and Umber, who are the two ram gods of Fillory. There was a planter of two rams sort of just sitting right there as I passed through that passage and looked up. It was just a very simple moment, but it sort of was right there for me to see and take if I wanted – and I did. How far will the first season take us into the trilogy? Sera Gamble: A lot will happen in Season 1. We’re even dipping into book 2 a bit. John McNamara: Yes. That’s good. Sera Gamble: If you’ve read the books, then you know that Julia kind of wanders off the page a bit, and she comes back profoundly different and Quentin has no idea why. Then in book 2, Lev cycles back and he reveals what Julia has been doing all of that time. We’re playing those two storylines simultaneously. So we’re both getting a fair amount of the way through book 1 as we are telling Julia’s story, actually, kind of the origin story of her story in book 2. How much horror imagery will we get? Sera Gamble: We, too, are in favor of it. John McNamara: Well, the thing about Lev’s books that really drew me, because I’m not a huge fantasy fan I like it, but I’m not, like Sera is really a true die hard fan. But everything that’s truly terrifying in his books, truly terrifying, is what humans do to each other. That’s also the most transformative thing in the books. We’re going to lean right into that hard. Stella Maeve: There’s also an element of humor. John McNamara: Oh, God. I find the books hilarious, and that was one of the most fun things to adapt and play with, is the fact that it’s it’s not pastiche. It’s not camp. It’s not satire. But it’s self aware. The books are self aware. They’re very smart, and they’re extremely funny. The release of writing funny right after horror is really pretty much about the best day job you can have. Stella Maeve: They do it really well too.